Spotify has been working with Hulu on its $4.99 "Spotify Premium for Students" plan for nearly a year now, but the music streaming service is now introducing Hulu integration to non-students as well. At $12.99, it's not nearly as good of a deal as the student plan, but it's a nice discount for those who already have Hulu or want to give Hulu a shot. Plus, existing Premium subscribers can try Hulu out for three months for just $0.99. Given that Spotify Premium on its own goes for $9.99/month and the Hulu Limited Commercials tier goes for $7.99/month, you're effectively getting a $4.99 discount per month by subscribing to both via Spotify. You can also think of it as paying $3 extra per month to get Hulu access. The Limited Commercials plan is the same one that the student Premium plan currently offers, for what it's worth. Unfortunately, you can't throw an extra few bucks Spotify's way to upgrade to Hulu's ad-free premium plan. In case you needed some clarification. At this time, the deal is only available to existing Spotify Premium subs. Spotify is offering three months of Hulu access for a paltry $0.99. Even if you already have a Hulu plan, you can still take advantage of this so long as you're subscribed to the Hulu Limited Commercials plan, you don't have any add-ons (e.g. HBO and Showtime), and you pay through Hulu directly. The $0.99 offer for three months of Hulu expires on May 10th, so don't wait up if you're interested in it. 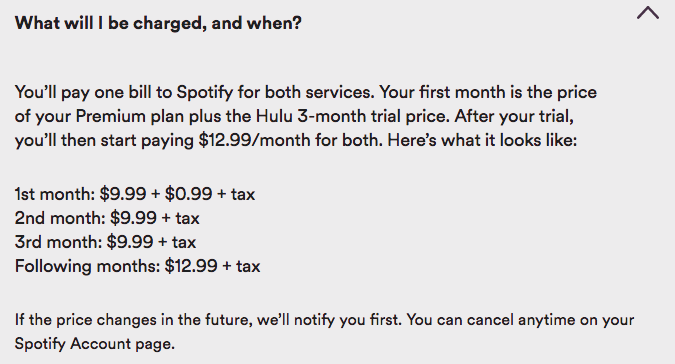 You can cancel that any time you'd like, so if you find that Hulu isn't to your taste, you don't have to go through with the $12.99/month shebang.